The mouth of the Huron River was one of the first Ohio ports to become settled. As early as 1749, a French trading post operated from this port, although it was abandoned during the war with the British. In 1805, a Canadian Frenchman opened another trading post along the Huron River. By 1824, there was a small boarding house for workers at the harbor and at least five log cabins, including one housing the first shipbuilder of Huron. Other shipbuilders followed, and the steamboat DELAWARE was built in Huron in 1834. The first lighthouse was built a year later, and its concrete foundation can still be seen today. 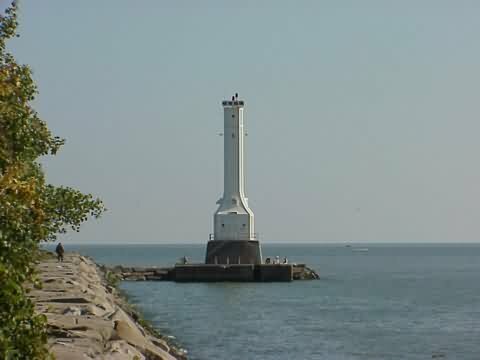 The modern white steel light marks the entrance to the Huron Harbor. Its 72-foot-tall tower was built in 1936 on a pier that extends from the shore. F.P. Dillon and W.G. Will built two similar lighthouses the same year. Huron's "sister" lighthouse stands in Conneaut. The light was formerly operated by remote control from a brick station on shore, and it had a lantern at the top. It was automated in 1972. The lighthouse is still operational and is managed by the U.S. Coast Guard. Although the lighthouse itself is not open for tours, visitors can walk along the mile-long pier from dawn to dusk. From SR-2 in Huron take exit for SR-13 north (Mudbrook Rd). Once on SR-13 drive 1.6 miles to the intersection with SR-6. Take a left onto SR-6 then take your first right onto Williams St. In 0.6 miles take a right onto Wall St.
At the end of Wall St. there is parking on the left. Follow the cement breakwater until you reach a point where there is a crumbling cement structure in the path of the breakwater. To the left of that there is a short dirt path that will get you around that structure and onto the stone breakwater. From there you can continue walking out to the light. Gary P. Richardson and Anna P. Klein, unless otherwise noted. No images or content on this site may be copied or reproduced without prior permission.